Still waiting for that below average summer I was told was coming. Can't wait for August as this July was nothing but above average. Any days at all below average high this month? wonder when it will get here. I don't exactly remember the CPC forecast, but I'm betting it was something like a 40% chance of a below normal summer which is more then the 33% equal chance. Meteorological summer is only half over. We could see a record cold August and it would all even out to normal or below. In the meantime, if our meteorologists can't get a forecast right 24-48 hours out, how are they supposed to forecast an entire season? so my next thread would say something like this....How will Don affect our forecast??? ?...as matter of fact that's how I would word it. With the ridge locked in place over the southern plains I would expect the remnant of Don to move NW thru texas and then come up the rocky mountains. I would expect a good chance of Don's moisture affecting at least some part of the upper midwest/northern plains. They are climate outlooks issued as probabilities of temperatures/precipitation to *deviate from climatology* for a three month period based on terciles. Climatologically, there is a 33% chance of temperatures/precipitation being below, near, or above normal. An outlook that deviates from that will detract first from the opposite extreme (to a minimum of 3%), then the middle tercile. For example, an outlook for June-July-August of 60% probability for below normal temperatures means 60% chance of the *average temperature during June-July-August* being in the lowest tercile, 33% chance of it being in the middle tercile, and a 7% chance of it being in the upper tercile. the system is rather small and by the time that moisture arrives in MN it'll be quite high in the atmosphere and not do much for rain chances. The initialization of the central pressure isn't a massive "miss" for the models as the storm as about to make landfall and will be quickly decreasing in intensity at that point. When the guys at the National Hurricane Center can't believe what they see, you know something crazy happened. Another busted forecast...didn't check anyone else this morning but @morningwxguy was particularly cocky this morning before his forecast fell flat on its face. When I went to bed last night, they had isolated t-storms for today at a 30% chance. This is a 100% washout. The rain won't move out of the metro until 4-5 pm at the earliest. Cloudy all day. No way we hit 90, though for that, I'm grateful. 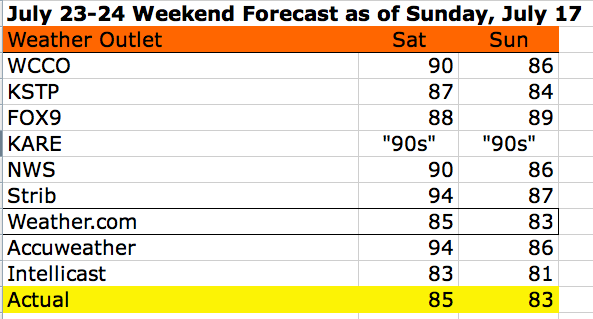 I wish you would compare the forecasts to what really happens every weekend and post the results. I'd really like to see this. Finally, in a situation like today's, EVERYONE had a bust as far as I know. And actually, this happens a lot as they're all going off the same information. 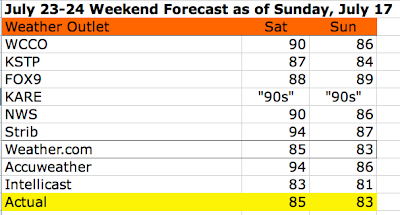 What exactly would you like to see compared for weekend forecasts? Specifically, using the forecast from which day? Can anyone recall another summer with these huge rain spikes? I can't. I've been impressed with this series of storms producing torrential rainfall. Here's another stupid question. All this rain is keeping the ground wet. So when the water evaporates it unleashes more water into the air...leading to another deluge...and the cycle continues. Or am I way off base? This has certainly been one of the most humid summers on record, hence the extremely warm low temperature average in July. It's ridiculous. I would give anything for an 80 degree day with no humidity. Anything. I checked the NWS around 7 AM and they showed a 20% chance of rain where I live (Shakopee). Then I looked at the radar and estimated a 100% chance of rain. Do they ever leave their computer models and just look at the storms that are moving around? Today was really one of the better busts for a while. Just added a fresh post to discuss today's busted forecast.